I was an observer at a workshop and conference recently. As happens at these events, people were split into various groups to consider specific subjects. Lots of interesting discussion was generated and many good ideas came out of it. By the looks on their faces, the participants felt like they had made good solid contributions to the overall topic and really helped move things along. You’ve been to those types of event haven’t you? But as I moved from one session to the next, it became obvious that the participants hadn’t spent much time understanding the problem, and they had generated a lot of really good solutions to problems they didn't collectively understand. With a little more consideration of the process, much more useful information could have been gleaned. Use of a simple rule and a simple tool would have significantly improved the quality, richness and usefulness of the information that came out of the day. Really understand the problem before you try to solve it. Spend time making sure that all participants see it the same way. Ask lots of clarifying questions. To be effective you must get this out of the way upfront - and be explicit about it. This discussion gets participants alignment and buy-in. Otherwise you end up with unhelpful arguments occurring during the main brainstorming discussion, or worse still, people shut down and opt out of the discussion when they realise that they are not sure what the heck everyone is talking about. The Know / Don’t Know Matrix. Whenever you are brainstorming, it is a good idea to be aware of all four boxes in the matrix and structure your conversations to address all four. Left to our own devices, we spend most of our time in the Open box. 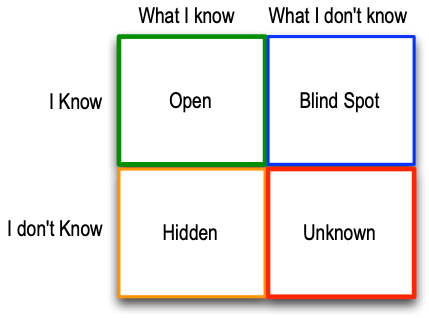 We maybe will drift in and out of the Blind Spot and Hidden boxes; more trying to avoid them rather than embracing them. We remain completely oblivious to the Unknown. I Know What I Know: this is all the stuff that is at the front of our minds. It’s made up of everything that is going on in the here and now. Information we are working with day-to-day. Issues we are having, things we are feeling strongly about. Left to ourselves, we will spend most of our brainstorming session in this box. And, we will often bend the original question to fit an answer we have in this box. In the recent conference, this is where I saw the energy, and emotion, coming from. I Know What I Don't Know. It is OK when brainstorming to say, “I don't know”. The questions that you don't know the answer to could be crucial. Capture those questions. This is like the blind spot at the side of the car, you know it’s there, so take an extra careful look. I Don't Know What I know. Group sessions really help here. You trigger each other’s thoughts. Someone will mention something, for example: “dog”, and everyone will see in their mind’s eye a dog they know (did you just see a dog then?). The mind is very good at storing information away – and often it just needs a trigger for a thought that had been hidden for years to come back to the surface. And, if you can make those triggers visual, the connections and recall will be a lot quicker and more powerful. When possible, stand around a whiteboard, each with a pen and draw rather than write. Stick people (and stick dogs) are good enough. I Don't Know What I Don't Know. Again, groups are really useful here – but bring in people from different disciplines, different cultures, people who 'think different'. You want people to ask the crazy questions, to provide different perspectives, or have some unique experience. There is so much that we don't know that we don't know – we don't even know to ask the question - but now we are at least aware that this area exists and we can take steps to explore it. It is here that true creativity and innovation can occur leading to new systems, new products, new approaches, etc. And there is a bonus: Using this Rule and Tool will not add extra time to achieving your objectives – in fact, they will save time and provide a better outcome. And now you have read this – you know that you know the rule and the tool - it even has a catchy title so it will stick in your mind. Are you getting the most out of your brainstorming sessions? If you want to discuss, please get in touch with me.